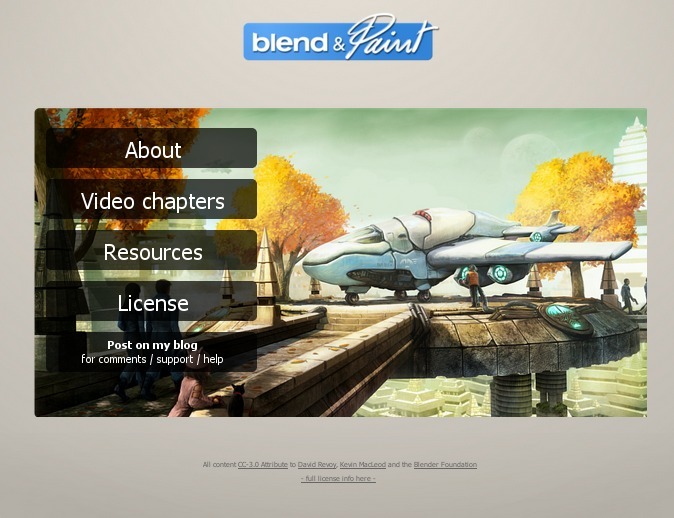 Last week, my future DVD Blend & Paint ( page on the Blender e-shop ) has received a correction of English at the Blender Institute. Big thanks to Tony Mullen for taking the time to watch all the DVD and corrected my mistakes here and there. While correcting I did all the DVD menu , here are screenshots of the main menu. ffmpeg -i $mpegmovie -threads 0 -vcodec libvpx -b 1500000 -rc_lookahead 16 -keyint_min 0 -g 360 -skip_threshold 0 -level 116 -qmin 1 -qmax 51 -minrate 0 -maxrate 9000000 -acodec libvorbis -ab 192k -ar 44100 -ac 2 -pass 2 -passlogfile pass1.fpf "$frameoutput"
In Chaos&Evolutions DVD I selected the OGV Vorbis/Theora video, but not this time because having really bad result with ffmpg2theora, ffmpeg and Gstreamer to try to convert to a proper OGV video ( laggy, frame missing, intro sound out of sync ...etc... ). For the final Blend&Paint DVD I finally took the Mp4 codec ( libX264 ) after my test above . Mp4 seams to be actually the easier codec for being read threw an Html menu ( thumbnails direct links to the video ) . Now, this next days the DVD will get tested at the Blender Institute by Pablo Vasquez ( http://venomgfx.com.ar/ ) and Ton Roosendaal ( http://en.wikipedia.org/wiki/Ton_Roosendaal ) at the Blender Institute. License: CC-BY David Revoy, www.davidrevoy.com, 15 april 2011 . Congratulations! You must feel relieved ...now what? I am looking forward to seeing your work (as always). Hi David. I've pre-ordered the dvd and I am also looking forward to seeing it. I should thank you for sharing your scripts with the settings you used for rendering your videotutorials. However, I have to disagree with the choice of format/codec made. On the one hand, you seem to have compared only the size of the output files, not the actual bitrate used in each case. That's not a valid comparison. My suggestion would be to try a much larger gop size (say 1000), a bit rate around 500000 kbps, qmin at 5 and qmax at 63 and render out in webm format. Then if you compare the image quality in connection with the file size you will realize that your initial comparison was off a little bit. Technically, h.264 might be a bit superior but with screencasts this is not going to make a difference if you compare it to webm. On the other hand, webm (VP8 & vorbis) is the only patent-free format available today. Mp4 uses the h.264 codec which is not patent-free. In my opinion if you choose open source software then it makes perfect sense to also choose an open content format for delivery. When comparing the resulting webm file with an mp4 losselss compressed file there are neither discernible differences in image quality nor in file sizes. In fact the size of webm is often smaller than the size of the mp4 encoded file. The main difference was in terms of the time my quad core took to encode the videos. H.264 is at least twice as fast in lossless encoding using the standard ffmpeg presets. @Blendercomp : Hey ! many thanks for the tips and code around webm :) too bad I know it after the DVD is done and iso already into production. I will test it for sure on rendered files, and post-edit this blog post later to reflect new webm test . For the patent free, sure ! it was a difficult choice :) ( my previous DVD Chaos&Evolutions used only *.ogv because of it ). Webm is very promising, and the truth is I didn't know very well about video compression ; I just adapt script shared on forum and test them to see how they work on the output. That's why I compare mostly the size ; the fast way to play and jump on the timeline on with small computer processor, and the adaptability to various player (cool for user if they can open it in Quicktime and Windows Media Player too without plugins ). I think I did the right-choice this time with the constrains and the tool and informations I get. It was hard to play 100% open format this time ; it will be better in the future for sure ! Thanks again for your comments, and wish you the best with your video tutorial series . :D A secret :) I will try to ask my publisher if I can publish on this blog the WIP, but in a nutshell ; I'm working on a board game and a lot of book covers till June. @Eike : hey Eike, you can certainly find it on Youtube nowaday, as the full DVD was in CC-By license ( same as Sintel ). But if you want to buy it, thanks in advance, it will be a donation for the Blender Foundation and every donating count. 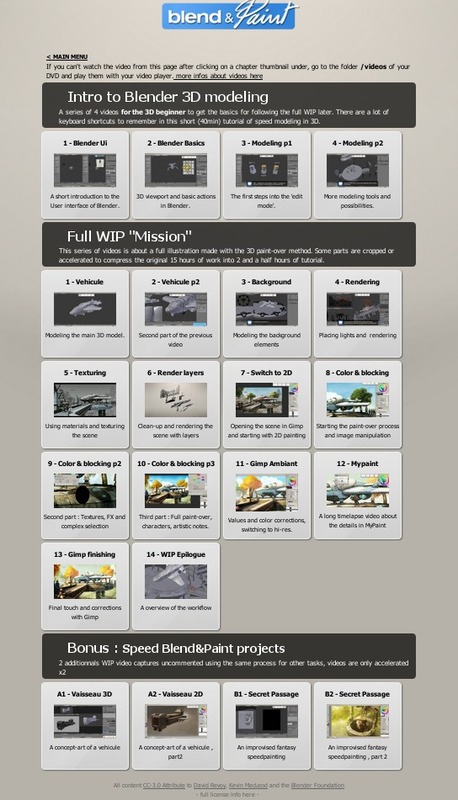 I don't think I will update it, but I will surely create new content ; with updated way to do it. Thanks for reading and for the nice feedback. I certainly love to support the Blender guys but I already bought their last two prerelease DVDs . Would you get a portion of the sale though? And is the emphasis of the DVD more on the Blender part or mostly on getting off the ground with Mypaint? Are you touching a bit handdrawing techniques on a tablet? I got a Aiptek Slim Tablet and I haven't used it much yet and I hope to kick it of with your training. @Eike : Hey Eike, sure I get a portion of the selling on the presale, then each 1000 sold, witch happen rarely. ( I think both crossed 1000 but not 2000 ). It's a fair system. The money goes to the Blender Foundation exclusively ; about "handdrawing techniques on a tablet", I never did a tutorial really about that. I must admit I have difficulties with it , and I prefer most of the time draw on paper and paint after on it digitally. But it's a good idea ( I keep fascinated to the good drawer with a tablet ). Oh ok. Sorry to bother you so much but isn't that the workflow that you use in the training? Or do you print your 3d perspective, draw over it and than do than trace it? @EIke : Yes , I use paint-over technics ; I render a 3D version in black and white then colorize it on the top. as you created this menu? in which software? on windows I used the Auto media player over the studio that I use on Linux ?